Choosing a hearing aid that will work best for you may seem like a challenge. You need to balance your personal aesthetic, lifestyle and budget, as well as which model will work best for your type and degree of hearing loss. FYZICAL Therapy & Balance Centers certified audiologists helps break this process down into steps makes it more manageable. Determine which style will work with your degree of hearing loss. This is by far the most important step. There are six standard degrees of hearing loss: slight, mild, moderate, moderately severe, severe and profound. Those with slight, mild or moderate hearing loss are able to benefit from all major styles of hearing aids. Moderately severe and severe hearing loss requires a larger hearing aid, such as a behind the ear model. 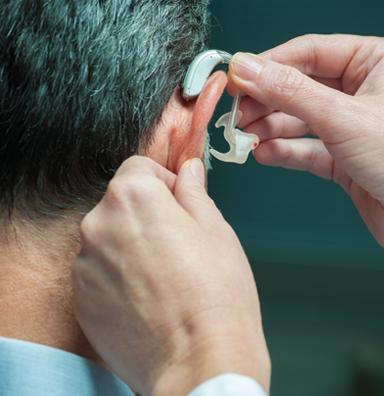 Those with profound hearing loss cannot benefit from a hearing aid, but may be good candidates for a bone-anchored hearing device or a cochlear implant. There are four distinct lifestyles: private, quiet, active and dynamic. Those with a private lifestyle are only around minimal background noise. Therefore, their hearing aid only needs the lowest level of technology. An individual with a quiet lifestyle is occasionally exposed to background noise but is typically in a quiet environment. They need only slightly more technology than those with a private lifestyle. An active lifestyle involves a moderate amount of background noise. Patients with this lifestyle are often in complicated listening environments and need more technology than those with a quiet lifestyle. Those with a dynamic lifestyle are exposed to a significant amount of background noise. This is the most advanced lifestyle, as individuals constantly switch between listening environments and need the most advanced hearing aid to keep up. Hearing aid styles range from practically invisible to those that sit noticeably behind the ear. While the styles that sit completely within the ear may be less noticeable, they can also only contain a limited amount of additional features. The larger the hearing aid, the more features and the longer the battery life. Hearing aids are expensive. The more technology and additional features a device contains, the more expensive it will be. While these may seem like a lot of decisions to make, don’t worry. Your audiologist will help you work through the process to determine which features you need to create the best hearing.